Heljan 'O' Gauge Class 52 Western. HJ5285 BR Green livery with small yellow panel. HJ5286 BR Maroon livery with small yellow panel. 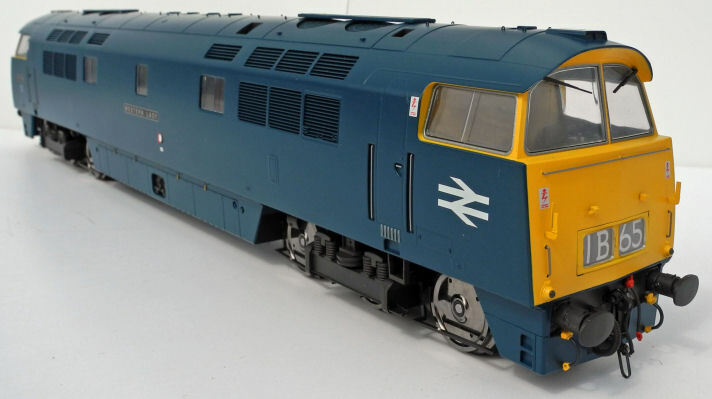 HJ5288 BR Blue livery with full yellow ends. HJ5290 BR Chromatic Blue livery with small yellow panels. Details of the names and numbers is included in the information boxes. Heljan hope to have these out around the end of the third quarter 2018 and we are taking advance orders for these now for immediate despatch. We are also offering our weathering service for these for people who wish to take advantage of this service. We have now recived test sample images of all of the planned liveries. There is also the option of sound fitting as well through the workshops at an additional £310.00 using the ESU v4.0 XL chip.  Heavyweight model, weighing 3.0kg.